The attacks by government forces on Jebel Marra seem to have subsided as the rebel SLM-AW claims victory over military convoy in the western part. No reports of ground-based military operations have been received from western and eastern parts of Jebel Marra on Saturday and Sunday other than aerial bombing. Villagers reported that the convoys with government troops that attempted to enter Jebel Marra from the east and the west withdrew. One force attacked the area from the west, and the second from the north-east. They used heavy artillery and missiles and were accompanied by intensive air raids, the villagers reported. The attacks continued on Thursday and Friday. The Sudanese government announced in October that its forces would “eliminate all rebel fighters during the next dry season”. Jebel Marra is a stronghold of the mainstream Sudan Liberation Movement (SLM-AW). The SLM-AW claims that its fighters repelled an attack between Guldo and Golo in the western part of Jebel Marra, in a battle that lasted from Thursday until Friday morning. Shahabeldin Jarrad, the military spokesman on duty for the SLM-AW, told Radio Dabanga on Sunday that they inflicted heavy casualties on the government troops. 20 soldiers and paramilitaries were allegedly killed. The rebels seized six Land Cruisers, one of which contained a 12-pipe launcher and 15 missiles, two Land Cruisers mounted with Dushka machine guns, large quantities of ammunition, and seven Kalashnikov rifles. Jarrad said that the aerial bombardments on Jebel Marra were still ongoing. “The Antonov aircraft of the Sudanese Air Force are focussing on areas in the vicinity of Golo and Rokoro. The Jebel Marra massif lies in the centre of the Darfur region, bordering the state divisions of Central, South and North Darfur. It is a fertile region inhabited mainly by the Fur tribe and has since 2003 been the primary stronghold of the SLM-AW. It is the only place in Darfur where armed opposition maintains prolonged control over territory and the only area in Darfur to which humanitarian organisations have had no access between 2011 and 2015. Parts of the centre of the massif, the ‘inner Jebel Marra area’, are controlled by the Sudanese government [blue] and parts by SLM-AW rebels [orange]. Main obstacles to free and regular access to the area include restrictions by the parties to the conflict, preventing humanitarian organisations from entering both government and rebel-controlled areas. 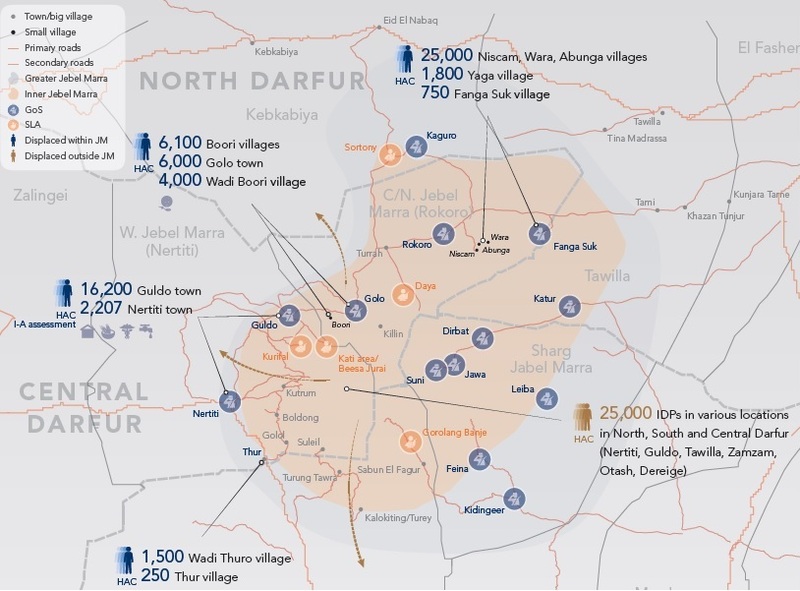 According to the UN Office for the Coordination of Humanitarian Affairs (OCHA) in Sudan, there are about 365,000 people living in the greater Jebel Marra area. Approximately one third of them -120,000 people- live in the inner Jebel Marra.